Book Two of the Girls of Spindrift. From the New York Times bestselling author of the Flowers in the Attic and My Sweet Audrina series, now Lifetime movies, continues a haunting new series featuring highly intelligent teenage girls who struggle to survive a specialized high school and find their place in a world that doesn’t understand them. Being gifted is not something Donna ever wanted. It’s difficult enough to have a Latino father and Irish mother, and her genius only separates her even more from the other girls. They don’t say it, but they blame her for everything that goes wrong, just because she’s different. And on the precise day she tries her hardest to fit in, everything turns out a disaster. A fight breaks out, and somehow Donna ends up in the middle. It’s not her fault, but it’s her word against theirs, and this time, the other girls aren’t going to stay quiet. The only solution might be to escape to the mysterious school her counselor is telling her about: Spindrift. The four Girls of Spindrift novellas together form a prequel for Bittersweet Dreams—available now! One of the most popular authors of all time, V.C. 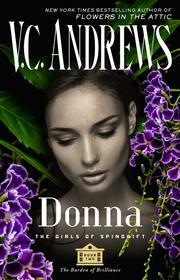 Andrews has been a bestselling phenomenon since the publication of Flowers in the Attic, first in the renowned Dollanganger family series which includes Petals on the Wind, If There Be Thorns, Seeds of Yesterday, and Garden of Shadows. The family saga continues with Christopher’s Diary: Secrets of Foxworth, Christopher’s Diary: Echoes of Dollanganger, and Secret Brother. V.C. Andrews has written more than seventy novels, which have sold more than 106 million copies worldwide and been translated into twenty-five foreign languages. Join the conversation about the world of V.C. Andrews at Facebook.com/OfficialVCAndrews. Though this one also brought both novellas together. I liked Donna. I like that she's a wiz. I like the sounds of Spindrift Academy too! Sounds like a school filled with the most interesting students and staff alike. So much so, that I can't wait to read more from this series. A definite good start to the series! I actually didn't realize that VC Andrews was still writing books, but she's one of those authors I'm nostalgic about because I read her as a teenager. Actually, her children have continued on her writing and legacy.